I have some good story ideas for either a blog or something longer, like a book which my mom suggested I start working on, but instead, I’ll just tell you what my average days are like here. Because that’s much easier. I wake up before 8:30, because I would lose Warrior points otherwise, and eat about a cup of steel cut oats. Sometimes a little more or a little less. I soak them the night before so I don’t have to boil them on the stove. If you soak them overnight in water, you can just pop em in the microwave for 2 minutes and they’re done. While those are in the microwave, I cut up about four or five big mushrooms and start cooking them in a pan, and later add 2 eggs. By now the oats are finished cooking, so I take them out and cut up a banana in them. If we’re out of bananas, which has happened a couple times now, I use brown sugar–but I prefer a banana. While all this has been happening, I’ve drunk a few big glasses of water. Are you still with me? Now’s when it gets complicated. Everything has been cooked and put in bowls. I take the ketchup out of the refrigerator and douse the eggs/mushrooms. I don’t use hot sauce in the morning just in case it might upset my stomach while riding. After I’ve applied the ketchup, I take the eggs, oats, and a glass of water (I prefer the big mason jar). We only have one big one, and it’s always in my room but I can never remember where it is so I usually have to spend a good while searching for it. Anyways, I take all those three things over to the lazy boy in the living room, open up the shades because our stupid landlord guy always closes them, and eat breakfast in the chair. I know, this morning routine seems long and strenuous, but it has to be done. If I can get through all the food without having to poop, I do so. But that usually is not the case. So after a brief intermission while I sit on the toilet and read “What’s your poop telling you”–a book my brother got me for Christmas–, I return to the chair and finish eating. I don’t like to rush things, so I usually sit there for another 20-60 minutes doing just about nothing. Staring at a wall is a good way to pass the time, and sometimes I use my computer to search Velonews and Facebook. Neither are very entertaining as there are no cool races to read about right now and everyone on Facebook is super lame, except me. After my sit period, I cook dinner. This is almost always a combo of quinoa, rice, chicken or some other meat, and some vegetables. Once that’s done, I do some maintenance on my bike and get ready for my ride. I ride five days a week, each ride between 4 and 6.5 hours. My favorite ride is Mt. 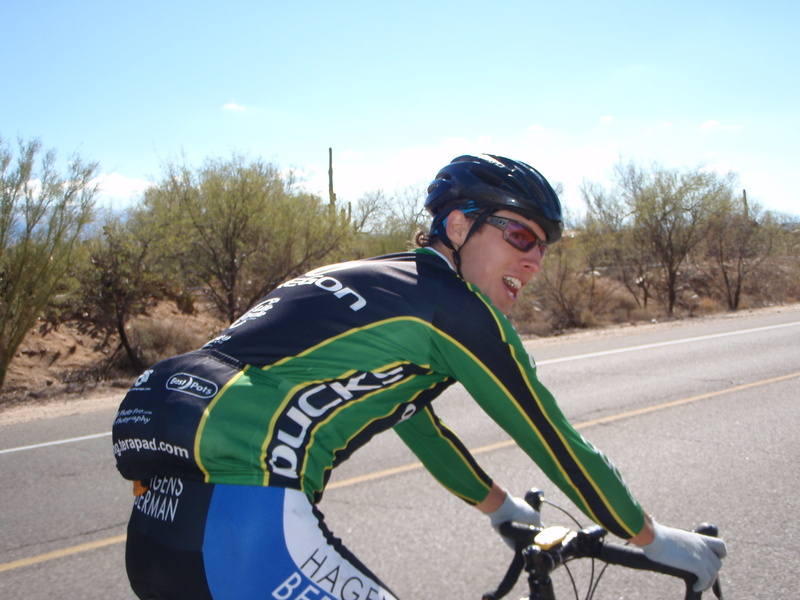 Lemmon, doing two tempo climbs up to 9 miles and back. Lemmon is great because there aren’t a ton of cars (technically there are), it’s beautiful, and I see a lot of people I know up there. Once a week I do some short intervals on Lemmon combined with some tempo, another two times during the week I ride the TT bike somewhere flatter (just started doing this, though, so it really isn’t a routine yet). And of course, there’s Saturday. The day my important routine has to take a break, because the Shootout starts at 7:30. You wouldn’t think that I would need to look forward to the weekend, but I do–because of the Shootout on Saturday and usually another group ride or at least a ride with other people on Sunday. Saturdays–Wake up at 6:00 and eat the same breakfast, minus the mushrooms, as other days. Plus I only eat 2/3 cups of oats on saturdays because of time and appetite. I guess I could get up five minutes earlier and have plenty of time to eat another 1/3 cup of oats, but that isn’t going to happen. I leave the house at 6:30 while it’s still dark (something you guys probably have to do every day since it’s dark up there in the north until noon). And then I ride to campus to meet up for the shootout, which I did today. When I get home from the shootout, I have pretty much all day to sit around since I get home at 11:30. I’ll make some food and watch two episodes of Star Trek The Next Generation on VHS. 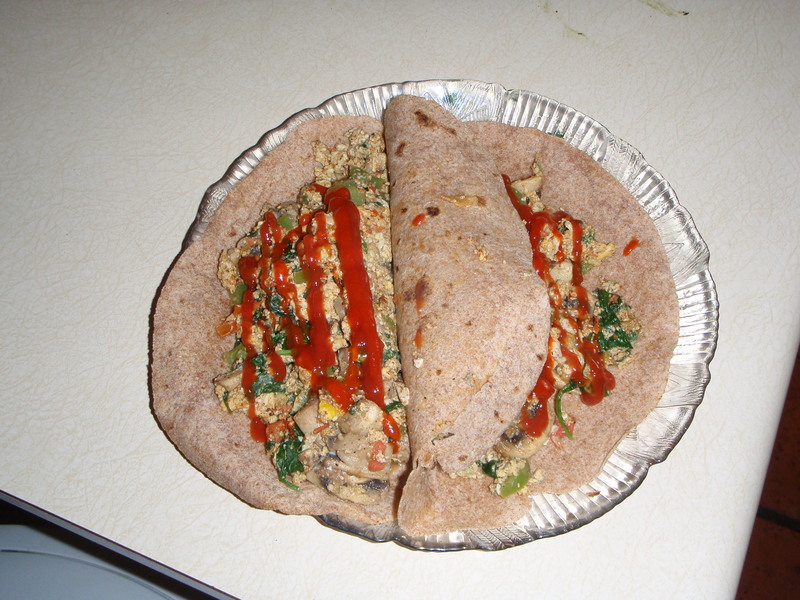 On saturdays, for my post-ride meal I make more eggs and mushrooms, and if I have any tortillas left I make it into breakfast burritos. Exciting, I know. After the first episode of star trek, I take my compression tights off and do the foam roller and stretch for about an hour. Then I have some more to eat. If it’s sunny outside, I’ll go lie in the sun and read. If not, I’ll read inside or maybe watch some movies all day long. Damn, I sound lazy. If Chris has time, we’ll play a game of chess, which can take hours since he spends 20 minutes moving each piece. I think it’s a distraction method he uses on me, because I start daydreaming and eventually go and eat something from the kitchen while he’s planning his move. By the time it’s my turn, I’ve completely forgotten what’s going on in the game. 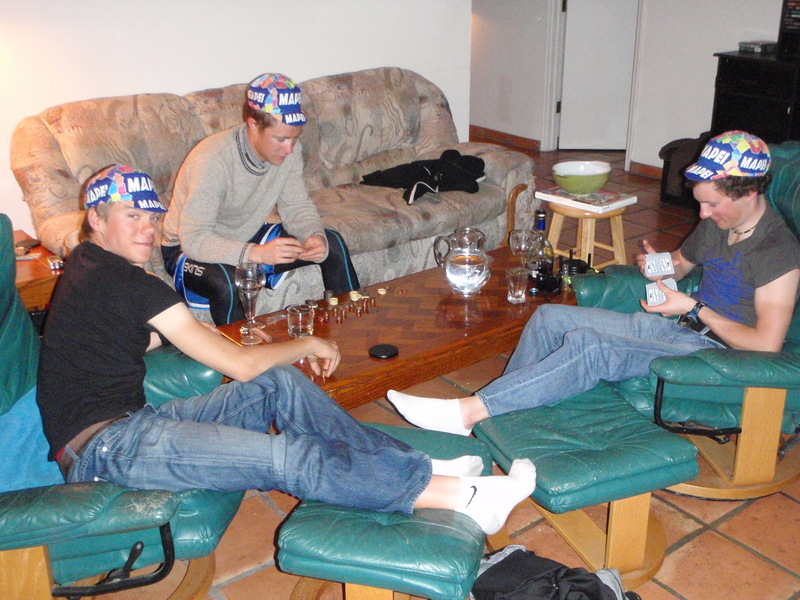 Once a week, we’ll have some other cyclists over for some Poker or dinner or something. Earlier, when I had a friend in town, I’d go hang out with her once in a while, but she’s gone. Another cool thing we do here is go shopping. It’s also become a routine. 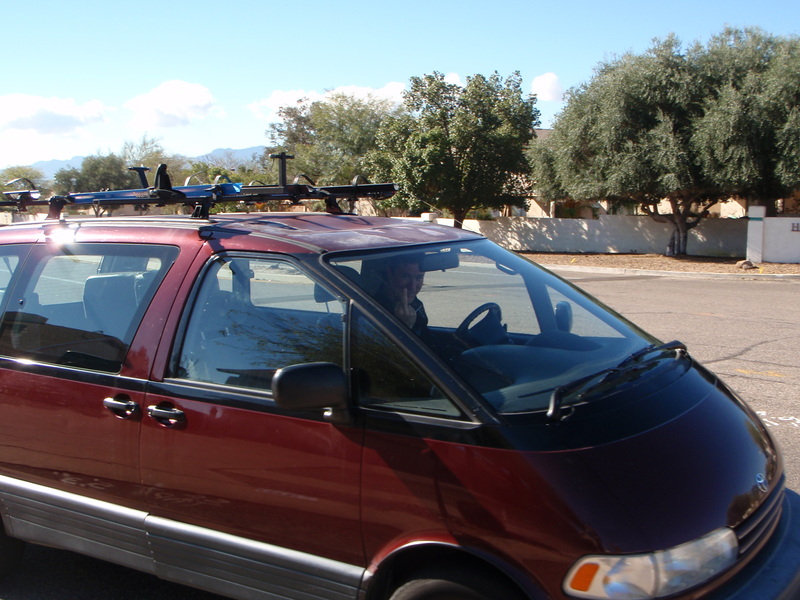 John, our weird landlord, drives us to Costco and then across the street to Sunflower–a cheap version of Whole Foods. He has four cars (something Chris and I openly despise) and he takes us in the Cadillac or his limo. Yes he owns a limo for some reason. When we go to Costco, we usually get some pizza and a frozen yogurt. Then at Sunflower, I sample the bulk food section to keep the hunger at bay. Between the two stores, I’ve eaten enough to get me home. Once I’ve gotten back from a non-saturday ride, I watch two episodes of Start Trek while I eat my quinoa and do the foam roller/stretching. By then, it’s time to eat some more and maybe go shopping for food. On my rest days, I do the exact same thing as other days, except I only ride 30 minutes–usually in the ”washes.” Washes are the concrete creek things for water to drain into. They’re everywhere down here, and are great for recovery rides. Hmm, what more? Like I wrote about earlier, we’ve gone hunting across the street a number of times. That’s about it. I’d like to say I’m keeping my mind fresh by reading and playing chess, but all I can think about is cycling. That’s probably a good thing. I’m still enjoying all my time on the bike and am very grateful for being able to live this monkish lifestyle. It may sound boring, but I wouldn’t trade it for anything. Except maybe the exact same life but only I had lazer vision. And could fly. And I could control what my farts smelled like. Can you imagine being able to fart the smell of almonds? Or even the strong stench of clean gravel????? Now that would be insane! Poker. I went out first. Both games by going ”all in” too many times. I HATE this stupid game. Chris drove a mile to give me a new tire. I had gotten too stingy with the amount of tread I had left and it wore through. Classic mistake that you have to make at least twice a year. Mt. 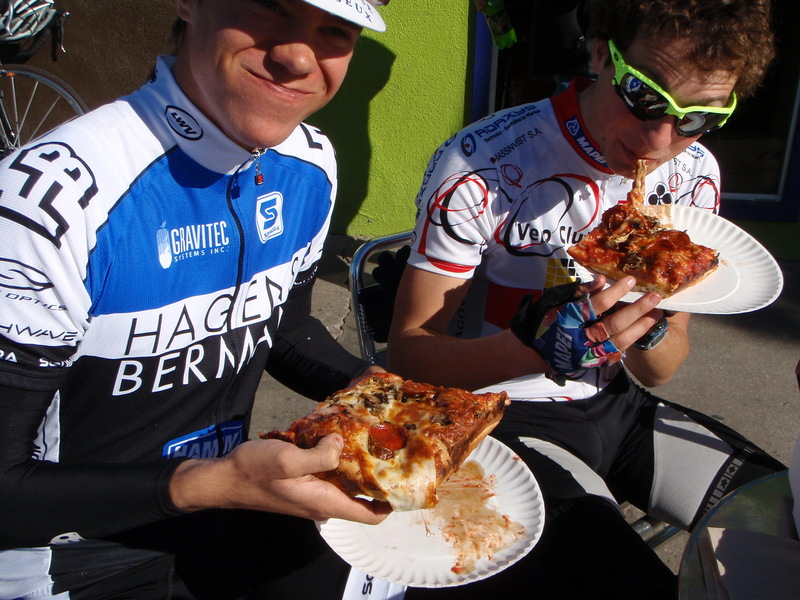 Lemmon was closed due to snow so we road back into town and ate a humungous pizza instead. Stupid auto spelling doesn’t know that I’m trying to spell humungous, so I’m going to just leave it spelled as it is. After each eating six pounds of pizza, we road to the base of “A Mountain” in town and raced up for some dumb reason. That’s Spencer on the left, Swiss Chris from Switzerland in the middle, and me on the right. You need to tell HB they should give you a new helmet… dork. that helmet has character! and it matches my black bike and bento box! Impossible to answer. It’s a chicken/egg scenario. the food descriptions are Awesome, and the poop ones of course! !